A man who never ventured into his kitchen at home in his earlier days, is the same one who’s taken kitchen affairs to a whole new level in North East India. 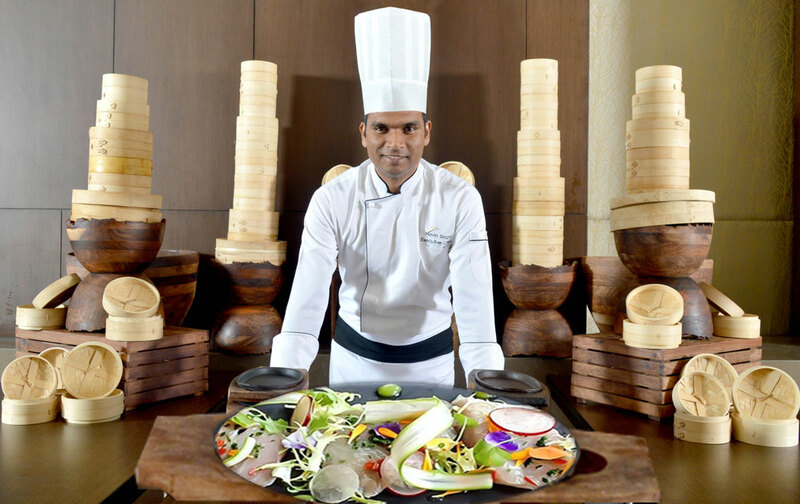 The man behind the scene, Executive Chef Navin Singh, took it upon himself to ensure the food and the ambience create a sensory delight for every guest in the North East’s first five-star hotel – Radisson Blu Hotel, Guwahati. It wasn’t an easy task to steer through the apprehensions, especially when you are the first to be doing something. Being the pre-opening expert that he is, Singh streamlined the unorganized supply chain, roped in the right vendors, held sessions on the five-star compliance needs and, if that’s not enough, he is working towards making Radisson Blu Hotel, Guwahati, the first ISO 22000-certified hotel in the North East. With Valentine’s Day coming up, TravelRasoi caught up with Executive Chef Navin Singh to see what’s in store for this beautiful day of love. This down-to-earth yet candid Chef took us through his professional touch across various brands and his personal bent towards making even home cooking ISO certified (if only, it was possible). What made you choose the profession of a chef? Honestly, it’s the white coat that fascinated me first. Also I felt chef to be the right choice from a growth perspective too. For instance, in the hotel industry, if you are a general manager you may not become a chef, but if you are a chef you can branch out to any of the divisions. In fact, during my initial days in the industry, I have met chefs who went on become general managers and some vice president of operations. What is Valentine’s day for you? 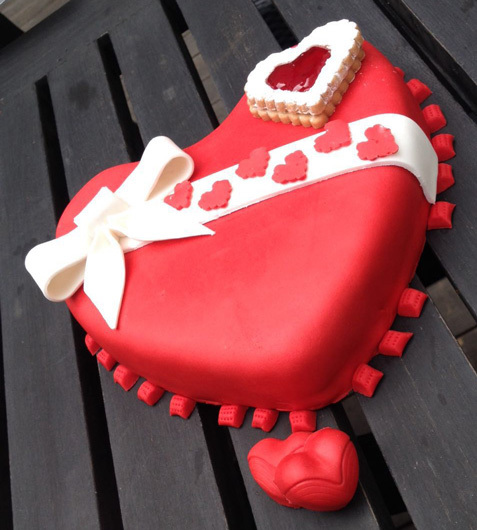 Valentines for me is a reason to celebrate the most important person in your life over gastronomic delights. How do you see people in North East celebrating this day of love? And what does Radisson Blu Hotel, Guwahati, have in store for this special occasion? People of North East, especially in Guwahati and Shillong, are known for looking for a reason to celebrate life. When it comes to a special day like Valentine’s Day, they would go all out to make it memorable by spending a good time in five star hotels, chic restaurants and thus renewing the bonds with their special ones. Radisson Blu Guwahati has seen people in Guwahati, Shillong and other parts of North East to come and unwind at the Hotel and its various restaurants. Keeping this enthusiastic crowd in mind, we have hand crafted a Valentine’s Day brunch, which will offer the very first Pink Heart Buffet Valentine’s Sunday. The exclusive buffet will feature Honey and herb-glazed slow-roasted ham, pink prawn and cress dotted with dill, shrimps Kilpatrick, braised lamb Wellington, roasted orange-scented duck, live Mediterranean non vegetarian and vegetarian grill, homemade pasta and the whole wheat pasta station. And the forever favorites – hand rolled chocolate, rose marshmallows, raspberry jelly hearts and a charming crêpes Suzette station, will comprise the sweet ending to the delectable brunch. We have heard about your pre-opening expertise, could you tell us more about it and your journey as a whole? My journey began with IHM Chennai. 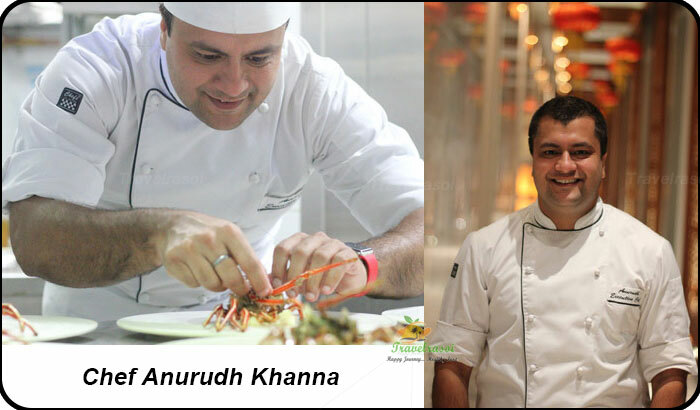 And after the completion of my studies, I joined ITC Maurya in 2001 as a Management Trainee and gradually moved up to be a Junior Sous Chef. In October 2004, I got involved with Le Meridien Hotels & Resorts as a Sous chef and later stepped on to the role of an Executive Sous Chef. I found myself seeped into an exciting journey of extreme food research, menu planning, among others. My career took a different turn, when I joined as the Executive Sous Chef as part of the Task Force that shouldered the responsibility to start the culinary wheels of Sofitel Luxury Hotels and Resorts in Sanghai, China. That’s when my pre-opening journey began. 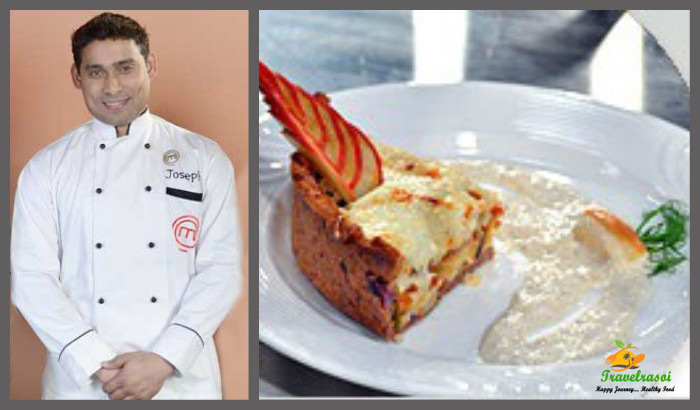 When I was back, with a new turn I found myself onboard of Novotel Hyderabad as a Banquet Chef. It was a great learning experience. A year from then, as part of the Pre-opening team, I joined The Westin Hyderabad Mindspace as the Executive Sous Chef. I moved from Hyderabad to Chennai for a successful pre-opening of Hyatt Regency Chennai, the first property in India. I was a part of the Task Force for two months as an Executive Sous Chef for the Grand Hyatt Singapore. I also was part of the pre-opening activities for Hyatt Regency Ludhiana as an Executive Chef. Now, with my pre-opening expertise, I am in Guwahati as an Executive Chef for Radisson Blu Hotel Guwahati overseeing the activities around this first five-star hotel in NorthEast. Tell us what makes being a Chef gratifying? The environment around my profession gives me a lot of confidence and satisfaction, and a sense of belonging and contentment. As a chef you must have exposure, be open minded and you should always be open to learn more. My focus was on Indian food, however, according to the need of the time, I travelled around to get a better knowledge on the cuisines. For instance, I was in Tuscany for a good hold on the Italian cuisine and expanded my journey covering almost all the regions comprising south and north Italy. I witnessed how each region has a special touch to the cuisine, like towards the north of Italy you would find the best cold cuts, such as ham. During your childhood, were you fond of cooking? As a child, I didn’t really cook. However, after I had joined the industry and as I took to it, I began cooking at home too. I still remember my mother’s surprise at seeing me cook at home. She couldn’t fathom how I, who never stepped into the kitchen in the early days, would become so passionate about cooking and everything about it. Also, cooking at home is very different from how you cook in a restaurant. You may come across the common view that if you are a Chef, you are good at cooking at home too. However, it’s not the case. When you are cooking in a professional kitchen, you tend to focus on a lot of things. It’s a completely different ambience with priorities, such as hygiene and food safety, among various other factors. I was travelling across Europe when I saw that even a roadside food vendor was aware of food safety. In fact, you cannot open even a small outlet without a Highway Authorities Product Approval Scheme (HAPAS) certification. 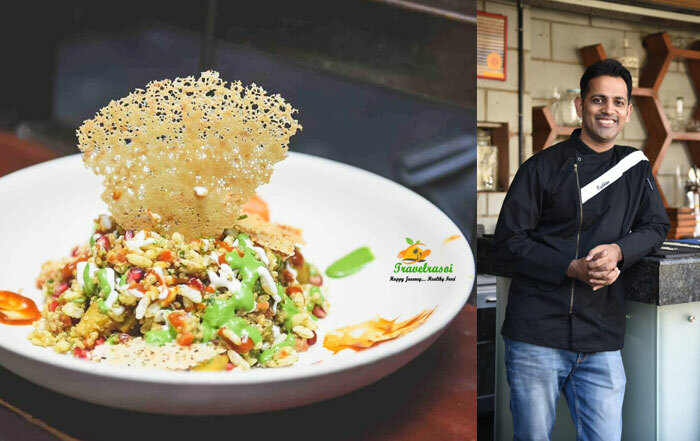 While in India, it wasn’t really a concern, but in the present times, with the government measures, such as the Food Safety Act, getting strong, a healthy ambience is more and more being accepted as the norm. Tell us some of the things that you, as a professional, follow within the kitchen. If I have to talk about the present, Radisson Blu, Guwahati, will be the first in the North Eastern region to be ISO 22000 certified. It is the highest certification for the food safety in the industry across the globe. Instead of going for FSMS or HAPAS, we wanted to stand out for the measures that we take within the hotel premises, thus, ISO 22000 was what we thought we should aim at. Of course, to be an ISO 22000 certified, we need to have various other certifications. For instance, all our vendors are ISO certified, and almost 50% of our vendors are HAPAS certified, while the rest have applied for it, and all of them have their trade licenses. At the kitchen level too, we have set in place a lot of measures, such as the Critical Control Point or CCP, as commonly known, which is a procedure/practice (control) in food handling/preparation that will reduce, eliminate or prevent hazards. In all, we have completed almost 75% of the process. You have come a long way, so whom do you consider to be your biggest critic or mentor? Well there are quite a few of them. To begin with, my previous boss Executive Chef Thomas Angerer at Grand Hyatt would guide me across minute steps that proved immensely helpful. Then there is Rashmi Uday Singh who was a great guide for me. And of course, there is Chef MS Gill who is a Corporate Chef of ITC Hotels, he has been a great mentor to me. There are many more who have helped me at different times and with whom I like to be in touch. I am sure you have come across ups and downs in your career, so what would be some of the critical moments that you remember? When I look back, I feel the first time I was working in Singapore, it was difficult. In the sense, Singapore is a place of multiple nationalities, and there were people from Thailand, Indonesia, Malaysia and even Singapore, there were also Indians but most of them spoke Tamil, and to be with 150 Chefs with such diversities was difficult initially. Then the head Chef Thomas C had to leave on an urgent business requirement, because of which two of us, one being me and the other Chef from Europe were given the responsibility to handle the big operations. To handle people from various nations, and some who had been there for around 30-35 years, with their set-mindsets, was hard. For instance, if I had to ask them to redo something or change a process, I was promptly reminded of my age being equal to their years of experience. However, thanks to my parents and their ways of bringing me up, I did not lose patience or let ego come into play. I knew I was there to get things done and was focused on the responsibility assigned to me. To do that, I gradually understood their perspectives and sentiments, and started taking into consideration what they had to say, thus to show that I was there to work alongside them and not against them. And believe me, once we reached that understanding level, everything turned smooth and people started trusting me. It went to a point that they didn’t want me to come back. Another struggle that I saw was while establishing the team in Guwahati for the Radisson Blu hotel. People in Assam I feel are quite sensitive and even somewhat protective. So, whenever they would know that there’s someone from Delhi who have come to manage the operations, the reaction wasn’t always very positive. And quite a few times I had faced the question as to how many people from Assam are there onboard. There seemed to be a general mindset that as I am from Delhi, the people I hire wouldn’t be from Assam too. I also observed that if someone from outside Northeast was hired, their tenure on the job hardly lasted a month or two as that sense of belonging was missing. The first six months had been a struggle, and slowly I changed my hiring focus. I began looking for recruits hailing from Assam and Northeast, who were working across India. Today, if you ask me about my team members, almost 60 to 70% is local Assamese and another ten percent is from around NorthEast. Now, I also see a great turn out of people in the hotel compared to the first six months. While working, I have also noticed that some of the young girls from Arunachal, Mizoram, Manipur and Meghalaya are extremely hardworking, and also from a local point of view there are people from the Rabha Community who may be a bit shy but when it comes to work they are very trustworthy and give their 100% in whatever they do. Would you like to share a message for aspiring chefs? The very first word is “Passion”. One has to be extremely passionate to be a Chef. Second, they have to be open to the fact that there is no life out of it. The reason behind it is if you are a Chef, most of the day you have to be in front of the heat, which will always be around 40 to 45 degrees. Also, there is a lot of pressure on you with regard to quality and time and of course with regard to expectations of your boss. And unless you are extremely passionate, it will not be possible to deliver your best in the initials days. Apart from that, one has to be very detail oriented and dedicated, which are the biggest factors to your success. There is no short-cut to success even in this industry, so, if you are looking to be a chef in one or two years, it will not happen. Heat oil in a flat pan over medium-low heat. Add the shallot and cook, without letting it brown, until fragrant and translucent, about 3 to 5 minutes. Stir in the stock, lemon juice and zest, herbs, garlic, and peppercorns. Bring the mixture to a simmer. While the poaching liquid heats up, season both sides of the halibut fillets with salt. Reduce heat to low and add the halibut to the pan. Cover and cook 8 to 10 minutes, or until the fish is opaque and flaky, but not dry. Remove the fish from the pan. Strain the poaching liquid, discarding the solids. 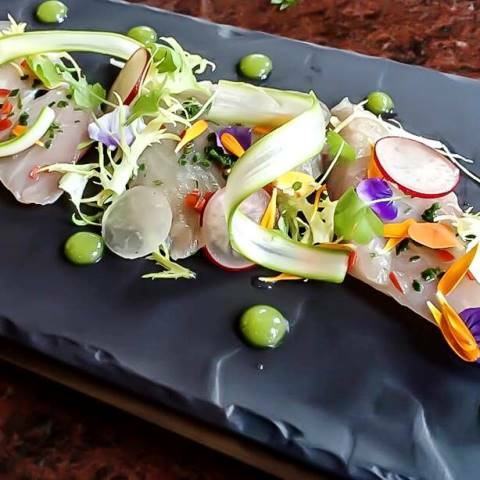 Served poached fish on slate with shaved vegetables, herbs, edible flower and dressed with wasabi cream. Share the post "Chef Navin Singh Is Busy Wielding His Kitchen Knives The Five-Star Way"